I was actually sent four different books for this Love Inspired book tour. I think this is an awesome idea, as it will showcase all four books and you will get to see different reviews for each review stop along the way. I have actually read two of the four so far, and plan to reach for the other two soon as well. 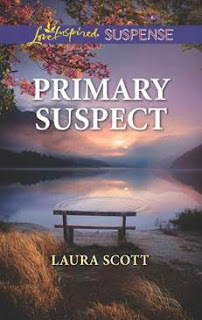 The four books are The Wedding Quilt by Marta Perry, The Rancher’s Child by Brenda Winton, Bound by Duty by Valerie Hansen, and Primary Suspect by Laura Scott. All of these are relatively short, so you will fly through them no matter which one you decide to pick up. I read both Bound by Duty and Primary Suspect each in one sitting. 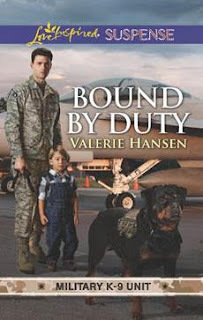 The other book I have read is Bound by Duty by Valerie Hansen. I love military romances, so I knew I would devour this one too. Again, this book is part of a series and is book two in the Military K-9 series. I really enjoyed this one. I really loved how we have a K-9 involved in the story and helping with the mystery. I enjoyed the plot and the characters in this one. I love how this involves animals as well. With this one being only 200 pages, I again wanted a little more. Make sure you check out the others in the tour to see what they had to say about the other books as well.